Whenever Tony Award winner Brian Stokes Mitchell visits the islands, he feels so at home that he says he can just "exhale." All concerts feature the 40-piece Matt Catingub Orchestra of Hawaii. Call 545-7664 or visit hawaiiromance festival.com. 7 p.m. Sunday at Waikiki Shell: Sergio Mendes, Kim Bum Soo, Martin Nievera, Amy Hanaiali'i and Jake Shimabukuro. Tickets $25 to $150. 7:30 p.m. Wednesday and May 8 at Hawaii Theatre: Brian Stokes Mitchell, Jimmy Borges, Anita Hall, Glenn Medeiros, Afatia, Mihana Souza and Kanoe Cazimero, $38 to $98. 7 p.m. May 9 at Waikiki Shell: Smokey Robinson, Matt Catingub, Robert Cazimero, Cecilio & Kapono, Eric Gilliom, HAPA, Kaukahi and Afatia, $25 to $150. 7:30 p.m. May 10 at Blaisdell Arena: Gladys Knight, Aaron Neville and American Idol's Kimberley Locke, $35 to $150. 5:30 p.m. May 11 at the Royal Hawaiian Hotel: Special Mother's Day dinner, fashion show and concert benefiting the Queen's Cancer Center, featuring Boz Scaggs. Tickets for entire package $250; concert only $95 and $150. 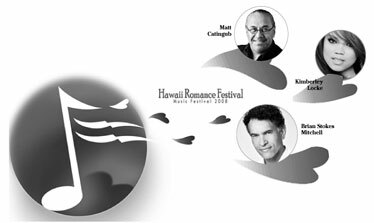 The festival concert at Hawaii Theatre is a continuation of last year's theme, "The Most Romantic Songs Ever Written." The definitive list of the Top 100 is being compiled every year in sets of 20, reportedly by more than 150 music industry experts. Reaching number 40 this year, songs include "Always on My Mind," "(You Make Me Feel Like) A Natural Woman," "I Will Always Love You," "Fly Me to the Moon" and "We've Only Just Begun." "This is going to be so much fun," said Mitchell earlier this week by cell phone as he was driving in New York. "I'll be doing at least three songs, two of them being 'How Long Has This Been Going On' and 'This Nearly Was Mine,' which I did on PBS in a concert version of 'South Pacific' from Carnegie Hall that co-starred Reba McEntire." But it was as a performer on the Great White Way that Mitchell has made his name. He won the Tony for his work in the revival of "Kiss Me, Kate," and is a nominee three times over for "Ragtime," "King Hedley II" and, most recently, the Broadway revival of "Man of La Mancha." "But I'm not really a Broadway singer in the classic sense, because I was raised on jazz and pop. ... I can sing pretty much anything I can get my tonsils around. People know me for my big, baritone Broadway sound, but I like doing cabaret, or what I'll be doing there in Hawaii." He says he notices the Broadway musical trend has "been more pop than it used to be, which is not a bad thing. Broadway has to evolve. Shows like 'Spring Awakenings,' 'Passing Strange' and even 'Wicked' have more of a pop sound than a Broadway sensibility." Mitchell has been concentrating on a solo concert career over the last several years, enjoying the rapport with audiences throughout the mainland. "As a singer, you always want to do well, but I do love a live audience. While doing eight shows on Broadway beforehand, each with lengthy runs, was vocally demanding, my son, Ellington, was born six years ago, so by concentrating on short tour schedules, I'm able to laugh and scream with him and not have to worry about my voice. ... I can sing in any kind of setting, whether it's with just a piano, a jazz quartet, a big band or a symphony. I just go where whoever wants me." When asked if he preferred any particular live setting, Mitchell did admit that "I love the intimacy with the piano. My voice is very exposed and audiences can hear every subtlety, and I can do more with a song. But there's also nothing like singing with a symphony. I've been lucky to perform with orchestras led by conductors like John Williams, Leonard Slatkin and Marvin Hamlisch. And to sing with Matt Catingub's orchestra, it'll be a special kind of fun. "Ever since my wife and I had our honeymoon in Hawaii, we try to make it a habit to visit every year," he said. Korean drama actor-singer Kim Bum Soo was scheduled to perform at Sunday's International Music Night at the Waikiki Shell as part of this year's Hawaii Romance Festival. (See this week's HiLife section for more details.) But due to visa problems, Soo will be unable to sing on Sunday. Soo also was scheduled to make an appearance during opening ceremonies for the free festival at Iolani Palace today at 6 p.m.
Headliner Sergio Mendes, along with Martin Nievera, Amy Hanaiali'i, Jake Shimabukuro and the Matt Catingub Orchestra of Hawaii remain on the bill at Sunday's concert. Tickets are $95 and available at the Blaisdell Center box office, all Ticketmaster outlets, by phone at (877) 750-4400 or online at ticketmaster.com. Call 591-2211 or visit hawaiiromancefestival.com.